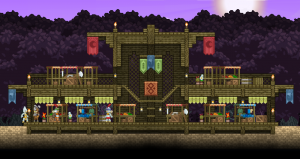 Market stalls inside an Avian Grounded Village. Avian Grounded Villages are a friendly Avian themed village made up of an small homes and market stalls. It was one of the earliest villages, playable through all of beta. These vilages can be found on any planet type aside from moons, any ocean worlds (including magma, arctic, and toxic), or garden planets. They are most likely to appear on jungle planets over any other planet type. Avian Hero Statue Decorative 110 A statue of a great Avian hero. Avian Lamp Light Source 45 A beautiful lamp built from Avian crystal tech. Barred Vent Decorative 40 A small barred vent. Basic Tombstone Decorative 50 The words honour a fallen Avian. Carved Counter Storage 85 A smooth cooking surface. Curtain Decorative 55 This looks like a nice place to hide. Embossed Tombstone Decorative 50 The words honour a fallen Avian. Grounded's Tombstone Decorative 50 The skull on this tombstone shows that it belongs to one of the grounded. Large Empty Market Stall Decorative 105 A large empty stall. I bet business is slow. Large Old Chest Storage 90 A large old chest, fashioned from wood and iron. Market Clothes Stall Decorative 120 Beautiful fabrics and clothing adorn this cute little stall. Market Fruit Stall Decorative 120 I wonder what fruit they sell on this planet. Market Weapon Stall Decorative 120 An assortment of pointy things. Rustic Bench Furniture 125 A beautiful rustic bench. Rustic Oven Crafting Station 70 Crackling quietly, the smell of hickory smoke is delightful. Secure Wooden Crate Storage 75 A secured wooden crate. Small Avian Bookcase Storage 125 This book case was built to store Avian history. Small Empty Market Stall Decorative 90 A small empty stall. It looks sad. Smashed Tombstone Decorative 40 This tombstone has been smashed beyond repair. Stone Fountain Decorative 270 A peaceful stone fountain. The water gently flows. Village Bench Furniture 125 A comfortable Avian bench. Warrior's Tombstone Decorative 50 This tombstone belongs to a warrior, fallen in battle. Wooden Armchair Furniture 85 A comfy wooden armchair. Wooden Bed Furniture 45 A comfy wooden bed. Wooden Bed (domed) Furniture 75 A comfy wooden bed with a headboard. Wooden Blinds Block 0 Old wooden slats that don't let much light through. Wooden Couch Furniture 125 A comfy wooden couch, the stripes help it go faster.